St Lucia (pronounced loo'-shuh) is the home of the picturesque twin Piton volcano cones. It is also a leading honeymoon destination. These are the icon of St. Lucia (see photo above). These twin volcano cones majestically soar 786 meters (half mile) out of the turquoise sea. You can climb Gros Piton, the taller of the two. Climbing the Petit Piton is illegal. You'll find the historic ruins of Fort Rodney on this rock-solid peninsula. It was an island before a causeway was built in the 1970s to connect it to the mainland. This is the capital city and offers little of interest to travelers except shopping, accommodations, and its cruise port of call. 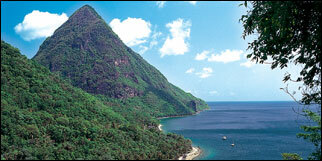 Nearly all the resorts are located along St Lucia's Caribbean side (northwest coast). Reason: The land is flatter, the beaches broader, the seas calmer, and the wind softer than along the Atlantic side. St Lucia has many fine resorts - and honeymooners make up a fair share of their guests. Piton photo is the property of the St Lucia Tourist Board and is used with permission.